Chris Dutton, right, with his Environment YES teammates. Four University of Sheffield science researchers, including Grantham Scholar Chris Dutton, have won the nationwide Environment YES innovation competition, beating off challengers from universities across the UK by pitching an idea for fully recyclable paper cups. The Sheffield team members were Jess Dunn and Grantham Scholar Chris Dutton, both PhD students in the Department of Molecular Biology and Biotechnology along with fellow PhD student Matt Wilson and postdoctoral scientist Chris Hepworth, both from the Department of Animal and Plant Sciences. 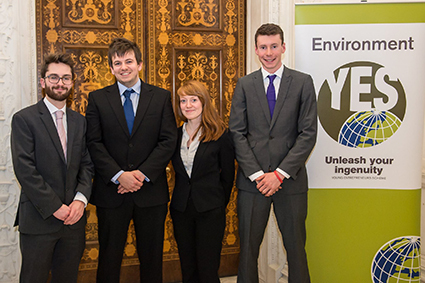 The Environment YES competition is run by the Natural Environment Research Council (NERC) each year and aims to provide early career researchers with experience of commercialising research and applying it to a marketable product. Inspired by recent media attention highlighting the use of 2.7 billion non-recyclable disposable coffee cups by UK consumers each year, the team sought a solution to this problem. The Sheffield team’s company, Cutico, proposed the use of a waterproof layer derived from the plant cuticle (the waxy outer layer that protects leaves), enabling the cups to be fully recycled in the paper waste stream. Cutico won the overall £2,500 first prize as well as the £500, Syngenta-sponsored, prize for the best plant, microbial and environmental business plan. Their success follow Grantham Scholars Hannah Sewell and James Lambert, who made it to the final of last year’s Environement YES contest.